Skal Labissiere hit a tiebreaking 3-pointer with 1.6 seconds remaining as the Sacramento Kings squandered a 19-point lead in the fourth quarter and escaped with a 102-99 win over the visiting New York Knicks. After the Knicks used their foul to give to force a second inbounds pass, rookie Bogdan Bogdanovic inbounded the ball to Labissiere, who calmly hit the shot from the left wing. Then the Kings were called for a technical foul when Zach Randolph ran out on the floor to celebrate as the Knicks were out of timeouts. Courtney Lee, who leads the NBA at 93.1 percent from the line, missed the foul shot. 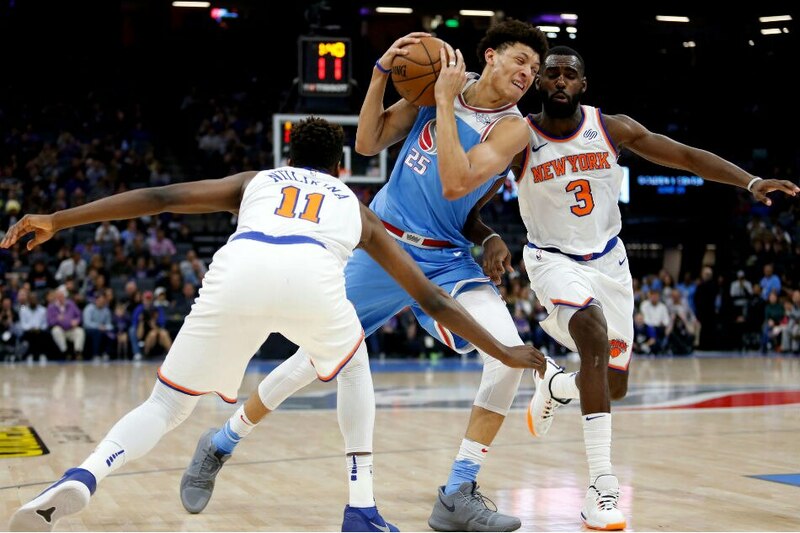 After Lee's miss, the Knicks were forced to inbound from under Sacramento's basket and the game ended when Trey Burke's 49-foot heave was well short. Bogdanovic led the Kings with 22 points and gave the Kings a 99-97 lead with an 18-footer over Lee with 29.7 seconds. Bogdanovic's only points of the fourth occurred after Vince Carter forced a turnover on Michael Beasley with 42 seconds left. Before the wild final minute, the Knicks stormed back but could never get the lead. They trailed 92-73 in the opening minutes of the quarter and forged a 97-97 deadlock on Beasley's fadeaway with 69 seconds remaining. Tim Hardaway Jr. scored 24 points for the Knicks, who lost for the 12th time in 13 games. O'Quinn and Enes Kanter added 14 apiece as New York nearly matched its largest comeback of the season. The Knicks missed their first 10 3-point attempts before Hardaway connected to cut the deficit to 59-54 with 9:27 left in the third. Sacramento scored the next 13 points, highlighted by a 3-pointer from Justin Jackson that infuriated New York coach Jeff Hornacek so much that he slammed his hand on the scorer's table in disgust. The Knicks made a slight dent in the deficit and trailed 83-72 going into the fourth before facing its 19-point gap and seeing its comeback fall short.